Against the broad head for Chinese (macrolanguage), which includes individual languages such as Mandarin and Yue (Cantonese), Ethnologue gives a worldwide total of 1,311 million speakers, as first language. A report in The Indian Express Monday described how Zhou Xin of Beijing Foreign Studies University (BFSU) uses the film 7aum Arivu (2011) and works of literature to teach her students Tamil. BFSU also has courses in Hindi and Bengali. The latter two Indian languages happen to be among the 10 most widely spoken in the world, while Tamil too features in the top 25. The list is headed by Chinese, a broad category that includes a number of dialects and variants. Ethnologue, a database whose website describes it as “the world’s most authoritative resource on world languages, trusted by academics and Fortune 500 companies alike”, provides details on all 7,111 known living languages. This is 17 times the 75 million people who speak Tamil, which is the 19th most widely spoken worldwide. 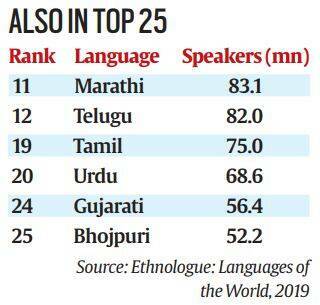 Hindi with 341 million speakers is at number four — behind Spanish and English — and Bengali with 228 million is sixth, behind Arabic with all its variants. 2 Lok Sabha polls 2019 | EC to meet social media firms today: What’s on discussion table?